Tuvkhun Monastery was first established in 1648 by the 14-year-old Zanabazar, the first Jebtsundamba Khutuktu, the spiritual head of Tibetan Buddhism for the Khalkha in Outer Mongolia, when he determined that the location on the Shireet Ulaan Uul mountain overlooking a hill at 2,600 meters above sea-level was an auspicious location. The first physical structures were built upon his return from studying in Tibet in 1651. Zanabazar, who was a gifted sculptor, painter, and musician, used the monastery, originally called Bayasgalant Aglag Oron (Happy Secluded Place), as his personal retreat over the course of 30 years and while there created many of his most famous works. It was also where he developed the soyombo script. The monastery was destroyed in 1688 by Oirat Mongols during one of their many military campaigns against Eastern Mongols. 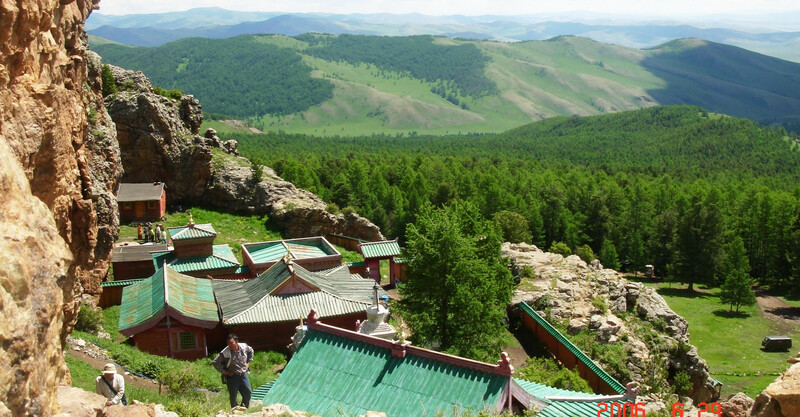 Restored in 1773, the monastery suffered severe damage during the Stalinist purges of the late 1930s as Mongolia’s communist regime sought to destroy the Buddhist Church in the country. Restoration of the monastery was completed in 1997. Ceremonies were staged to re-consecrate the monastery and a new statue of Gombo Makhagal (Mahakala). Several monks now reside and practice at the monastery full-time.